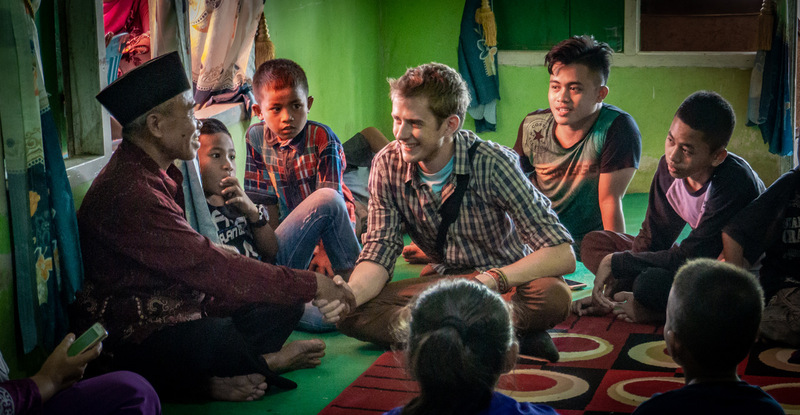 Ian Morse originally traveled to Indonesia to teach English with the Fulbright Scholar Program. He chose to return, however, to work as a reporter. When a 7.5 magnitude earthquake hit the island of Sulawesi, Ian Morse was en route to the Central Sulawesi province of Indonesia, he said in a video chat interview with The Lafayette. He got off the ferry in Sulawesi only to find that the earthquake had knocked out phone services across the province—he would wait another 12 hours to find out what had happened, and how high the death toll was rising. Morse, former Managing Editor of The Lafayette, has been reporting on the devastation from the earthquake and tsunami that struck Sulawesi, Indonesia, in late September. The disasters left 1900 people dead and 75,000 displaced, according to the Indonesian National Board for Disaster Management. Before the disaster struck, Morse had been in Indonesia for nearly a year and a half. He began his time there teaching English for his year-long Fulbright program. During that time, Morse was only able to write two news articles, but he did make important journalistic connections. He went back to the United States for a short time after the program ended, but returned to Indonesia soon after in an administrative position for Fulbright—and all the while, he dug more into freelance reporting. Although at first he faced difficulty getting published as a freelance journalist, Morse now has written articles for several news outlets, including Al Jazeera, Mongabay and IRIN News. Morse recently reported for Al Jazeera on the devastation in Sulawesi and the “urgent need for shelter as rainy season looms.” He spoke with survivors who are struggling not only from lack of shelter, but the devastating loss of loved ones. The earthquake left extensive damage to major cities such as Palu, according to The New York Times, and Morse has been focusing on spreading coverage to less prominent areas. Some of these “other parts” included the area of Kulawi, located in Sulawesi’s hills outside of Palu where the disaster left people isolated and with aid hard to come by. In Morse's coverage of this area, he interviewed a 39-year-old mother of three who was visiting her father during the earthquake in Kulawi. Morse wrote of problems the area was facing, like aid accessibility and distribution of resources. Morse has become passionate about Indonesia, but didn’t know a lot about the country going into his program. Morse first went to Indonesia through the Fulbright Scholars Program as an English teacher for a year. “The Fulbright program was a good way to get on the ground, but I think I came here knowing I was going to stay longer than that first year,” Morse said. After that year, Morse’s visa expired so he went home to the United States. Soon after, however, Morse returned to Indonesia to work for an administrative position with Fulbright, but to also continue his journalistic pursuits that started the year before. “It got me back in the country, where I had some journalism contacts to start with,” Morse said. While the scope of Morse’s coverage has shifted from college administrative policies to uncovering overlooked, disadvantaged people in Indonesia, Morse said he feels writing and working for The Lafayette gave him the necessary groundwork to be where he is now. For students thinking about living abroad after college, participating in similar scholarship programs or wanting to work and live in another country, Morse said he encourages them to fully participate in whatever culture they become a part of.